Janet Turnbull is doing her best to make sure borders never get in the way of finding an abducted child. 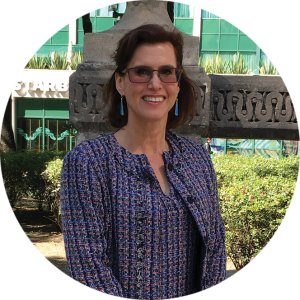 Since 2013 she has been working in Mexico City, Mexico, as a legal advisor for the U.S. Department of Justice, Criminal Division, Office of Overseas Prosecutorial Development and Training (OPDAT). Her focus is on human trafficking, which puts her at the center of making sure AMBER Alerts work in all countries. In May, Turnbull worked with the U.S. AMBER Alert Training and Technical Assistance Program and its Southern Border Initiative to organize the Trinational Forum in Mexico City. The 2-day forum included AMBER Alert Coordinators from the U.S., Mexico and Canada. Turnbull is also supported by the U.S. State Department’s Bureau of International Narcotics and Law Enforcement Affairs, with funding from the Merida Initiative. “What we are going for is to get AMBER Alert coordinators in Mexico, U.S.A. and Canada to see themselves as a single group of North American AMBER Alert coordinators. No borders,” said Turnbull. At the time of the forum, investigations remained open for 75 children taken from the U.S. to Mexico, and 183 children taken from Mexico to the U.S. The AMBER Alert began locally in the U.S. in 1996 and later developed into a nationwide initiative. Mexico’s Alerta AMBER began in 2012 when it was launched by that country’s president and attorney general. So far the Alerta AMBER has led to the safe recovery of more than 350 children in Mexico. Turnbull said Mexico coordinators still rely heavily on the National Center for Missing and Exploited Children (NCMEC) to confirm the right jurisdiction(s) in which to issue an AMBER Alert in the U.S. NCMEC can be reached by calling 800-THE-LOST (800-843-5678). She said it is easier for U.S. law enforcement to use Mexico’s child abduction alert because it can be done with one contact with the National Mexico Alerta AMBER Coordinator Blanca Margarita Niebla Cárdenas at 011-521-555-346-2510 or via email at blanca.niebla@pgr.gob.mx. “It is one call shopping for them,” she noted. Turnbull’s career began as a Special Agent for the U.S. Drug Enforcement Administration. Her investigation into drug smuggling in Columbia even uncovered an unfinished submarine in Bogota. She then got her law degree at the University Of Virginia School Of Law and began prosecuting drug traffickers and corruption cases involving public officials and police officers. Today, Turnbull is immersed in finding trafficking victims and abducted children. This year she has been involved with solving cross-border abductions including a Florida girl found in Cancun, a baby taken from San Diego, California, to Sinaloa, Mexico, and a Brownsville, Texas, girl who was recovered after Mexico issued an Alerta AMBER at the request of U.S. authorities. All 3 cases illustrate that much can be accomplished when countries work together.